Prehistoric people in Saharan Africa had dairy farming operations 7,000 years ago, a new study reports — an insight revealed by their pottery. Researchers performed isotope analysis on samples drawn from excavated pottery, and were able to identify organic residues that originated from dairy fat. 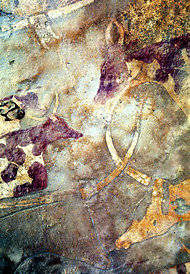 Domesticated cattle depicted in rock art in the Libyan Sahara. The findings appear in the current issue of the journal Nature. The researchers found that the pottery, from a site in Libya known as the Takarkori rock shelter, retained an abundance of carbon isotopes related to fats from ruminant animals, like dairy and adipose fats, said Julie Dunne, an archaeologist at the University of Bristol in England and the study’s first author. The analysis also indicates that the prehistoric dairy farmers were processing milk. This makes sense, she said, because people at the time were probably lactose-intolerant, and processing would have helped them digest the dairy more easily. Rock art found throughout the region also offers hints that dairy might have been an important part of people’s diet. “There are scenes of people and cattle, and the fact that they bothered to draw the udders — that’s why it was thought so,” Ms. Dunne said. In a few cases, there are even depictions of cows being milked. These images, however, could not be reliably dated. The technology to perform the isotope analysis was developed over the last decade, “but nobody had thought to look at the pottery and check the organic residue,” Ms. Dunne said.